The content of this topic has been archived between 22 Sep 2016 and 30 Apr 2018. There are no obvious gaps in this topic, but there may still be some posts missing at the end. Unfortunately, I killed my bootloader. Looking for ways to restore. there is 8 pins flash chip (JUST 8 PINS!). if you can unsolder it carefully and solder it back then you can resolve this problem. It should be easy! Unsoldered chip can be programmed with SPI programmator (google "программатор spi flash"). Pinouts of the flash chip you can find on the page 5. Send me your contacts and I will try to help you. Any support already for RTL8192DR ? dony71, insufficient amount of storage. I just purchased a new D-Link DIR-809 being sold in Brazil for a quite low price (dual-band, 802.11ac). Per what I searched, this router is also being sold in Europe and Taiwan. I opened it and below is the information about chipsets and memory I found on the Internet, as well as some pictures. Per comments above, I understand that 4MB of flash are not enough to even think running OpenWRT on this router, right? As far as I understood your device is built on RTL8881AN. 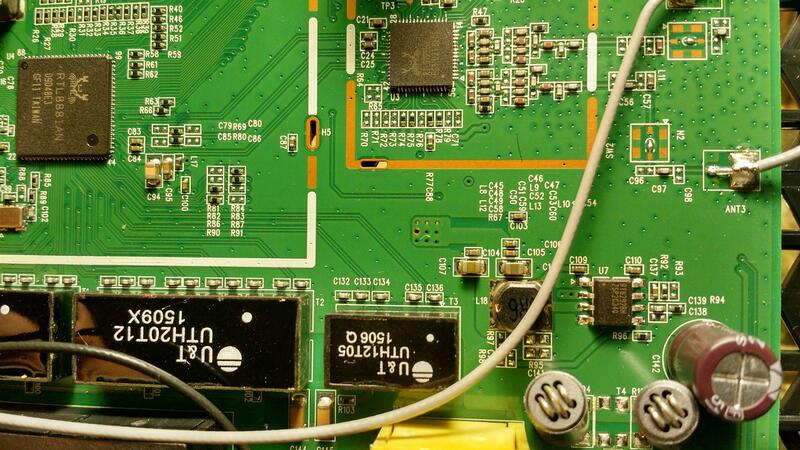 OpenWRT doesn't support this chip. Here were steps to create openwrt builds for RTL8196 and RTL8197. Possible in future some of them could be ported to RTL8881 too, but you will have to upgrade your flash chip from 25L32 to something 64..128M bits. ....too many dificulties for the pure device. Right, I will have to stick to the original firmware then. At least it has a configurable operation mode (router/AP/repeater), but the router is not 100% reliable with ADSL connections. !! !DO NOT USE IT IF YOU DO NOT KNOW WHAT YOU DO!!! i need to build Openwrt 15.05 for x86_64 arch with rtl8188ee support. 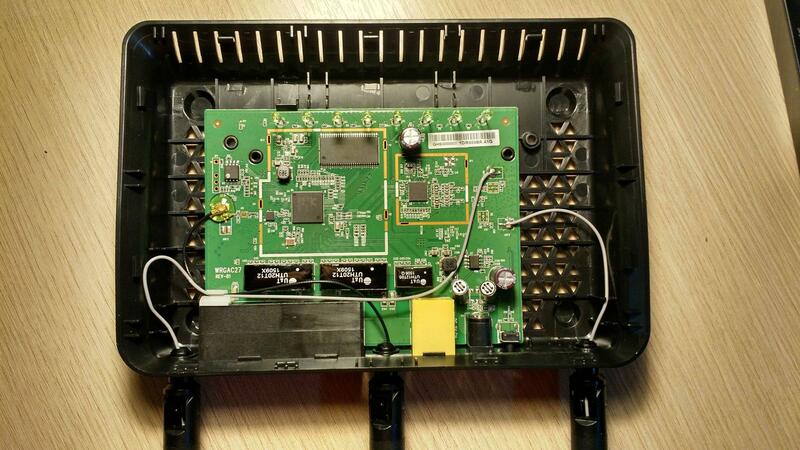 tristate "Realtek RTL8188EE Wireless Network Adapter"
How to build Openwrt including rtl8188ee correct? Hello all! Is there any way to get openwrt for RTL8196D (DIR-615-N1) Thanks. PS/ To: akryll I pm you in ICQ otvet. dsouza, RTL8881AN - supported, but flash chip is small for OpenWRT. You can try this FW: 8881A-FW OWRT (4.4Mb), but firmware image is 4.4Mb. Flash chip is not enough. New OpenWRT Build for Upvel UR-825ac ready. Download! Possible build for D-Link DIR-600L rev A1 with Flash upgrade? As the firmware is already working ? For totolink a2004ns can be collected ? Для totolink a2004ns можно будет собрать? i've added RTL_CARDS and necessary driver RTL8188EE in kernel menuconfig like you said. I've also added mac80211 and cfg80211 obviously too and rebuilt img. i have 15.05 version x86_64 architecture (custom device). How to fix it everything and get working wifi? taobaoDog, try to disable cfg80211. SmartBox, possible but unstable. (WiFi issues). loop223, Пока что под этот процессор не ведем сборку, возможно позже. Хотелось бы сначала обкатать все на одном устройстве. I have one DIR-615 rev. 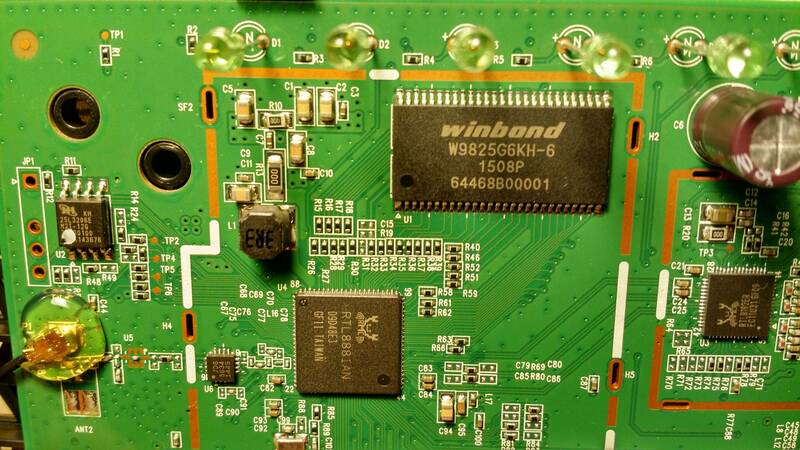 Q2, with Realtek RTL8196E, winbond W9825G6JH-6, MX25L3206E. I'm really not sure that any device with 4MB flash will have normal openwrt build. When I had some experience with the similar device (DIR-320 A2) there was only one acceptable build 'Backfire' 10.03.1. The next OpenWRT builds are on the next version of the Kernels and their sizes are more than 4MB. I tried assemble it without LuCI but that was terrible in control and there was a lot of errors connected with config saving. I installed OpenWRT on a different router with 4MB flash (netgear wnr2000v4, CHAOS CALMER (Bleeding Edge, r45528)), well the trick I used was minimize the build-side in make menuconfig by deselecting any tools that aren't absolutely necessary (of course I can't recall those offhand) -- hack USB support to the device and then use an overlay root filesystem on the USB. On the overlay, you can install further packages via opkg. (the original image must of course have the proper USB kernel drivers installed)... I wound up providing the router with 4GB of "ROM" storage, plenty for LuCi and other gadgets, with the only problem of on-board RAM sometimes limiting me.. Of course one may be able to modify the RAM storage -- in my applicable devices to at least 64MB (one slot) or 128MB (if additional RAM slot available or created) -- it's all a matter of how much time you are willing to put into it. I need some help, I've been researching this thread and have noted 3 serious resources for RTL/OpenWrt dev, but it remains unclear which of them is the latest and greatest. - http://archive.main.lv/writeup/building … 8196c.html -- is this outdated? Also, what exactly is "nprove" -- I'm worried if my device (below) is nprove. As far as why I'm interested in RTL/openwrt dev, I've been playing with an edimax-n300-cv-7428nS Universal Wifi Bridge, which uses RTL8196C, RTL8192CE (wifi), 2MB SPI flash, 16 MB SDRAM 166Mhz. I was playing with the GPL source and created an image with a telnetd server so I could explore a shell, which was fun until now. I'm thinking about increasing its storage to 16MB, and maybe SDRAM to 32or64MB.. Anyways I'm seriously interested in getting openwrt installed on this, just for fun. Of course, I will investigate it myself if no one answers. But, I must admit I might pass on taking up this project. А можно её шить на UR-515D4G? Вроде та же платформа, только без гигабитной сети. Или может есть возможность собрать под этот девайс? Would you please explain the procedure to download the firmware and boot loader from my netis WF2780 router and I will do so. It is too slow and I only use it behind my firewall as an access point. I have a Netis WF2780 and need the procedure to get the Flash and bootstrap downloaded for you guys. I only use it as an AP behind my firewall. Let me know how and I will do it ASAP.